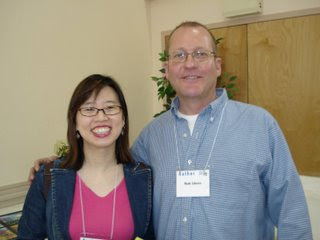 I met Wade Zahares several years ago when I attended In Celebration of Children’s Literature, a three-day-long conference at the University of Southern Maine at Gorham. The final day of the conference started off with the Maine Connection, a panel discussion with four authors and illustrators who lived in Maine. Wade was one of the illustrators on the panel. I hadn’t heard of Wade before and after listening to him speak I decided that I wanted to learn more about him and his art...so I attended his breakout session after the panel discussion. Wade showed his session participants some of his original picture book illustrations. 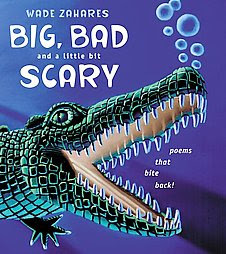 I was blown away by Wade’s huge originals—especially those from his book Big, Bad and a Little Bit Scary. I had never seen picture book art quite like his. It was bold and bursting with color. I was taken with the power of some of his images; the close-ups and different perspectives; the deep, rich colors he used in his art. Since that conference our paths have crossed more than once. 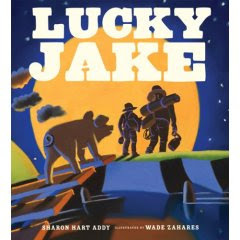 Last April, I had an opportunity to chat with Wade after a presentation he made about the art he had created for his most recent book, Lucky Jake, at the Newburyport Literary Festival in Newburyport, Massachusetts. We also talked at the Robert’s Snow Artists’ Open House in Newburyport in October. I jumped at the chance to interview Wade For Blogging for a Cure. I believe he is a talent on the rise. I know I'm not the only individual who thinks this illustrator is a mighty talented artist. 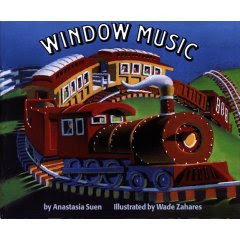 Window Music, the first book he illustrated, was selected as a New York Times Best Illustrated Children's Book. Elaine: Wade, you create most of your art with oil pastels. Is there a reason why you like working with that medium? 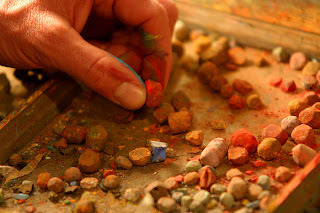 Wade: Actually, I work with soft pastels, a combination of Schminikee, Sennelier and Unison sticks. I’ve been working pastels for 25 years starting with college. At the time I loved working with charcoal, the compressed kind, working only in black and white on large sheets of paper. I was going into my senior year of school at the Maryland Institute, College of Art, when my instructor really wanted me to add color to my charcoal drawings so I picked up a blue pastel , I think it was Rembrandt or Nu pastel, and started adding it to my drawing on the cool side of the subject matter. The next week I added another color and then another color until it was a full blown pastel drawing that I really liked. I like the immediacy of the chalk and the flat soft look of the finished piece. Elaine: You really have a distinctive artistic style. 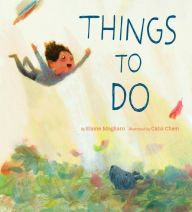 You use bold primary and secondary colors and lots of odd perspectives in your picture book illustrations. Did you develop your style when you were in art school…or later? Wade: I have always loved perspective and have been trying to take it as far as I can. My color has been developing over the years always changing. I started with a distinct style in school and have been pushing that continuously not knowing where it will take me. It’s funny, I teach a pastel class at an art school but have never had a pastel class myself. Maybe that has helped with my unique style. 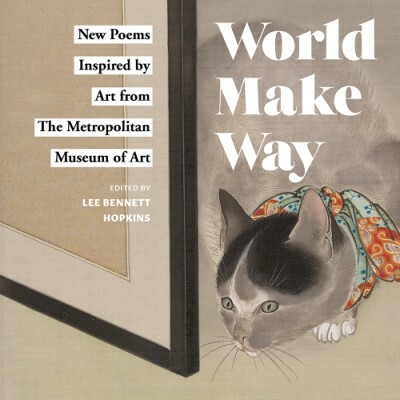 Elaine: Has any artist or illustrator influenced your work? 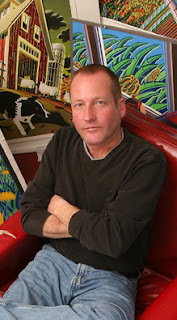 Wade: I may have been influenced some by artists like Edward Hopper, Grant Wood Wayne Thiebaud, but I have always been a strong believer in developing you own style and not letting others influence your work to much. Elaine: I have seen some of the original illustrations you created for your picture books Red Are the Apples and Big, Bad and a Little Bit Scary. They were really quite large. At the Robert’s Snow Artist Open House, you said you are beginning to scale down the size of your illustrations. Have you found it difficult working on a smaller scale? Wade: Years ago when I was working large, 30” x 40”, I would find it very difficult working small so I didn’t—but slowly over the years I have progressively been working smaller and smaller. It makes life easier carrying an entire book of original art to New York in the back of my jeep or on the train. I think the publishers also like it. I am beginning to oil paint in my studio, on a very large scale. I also am working on a 12’ X 36’ mural at Phillips Academy in Andover, Massachusetts. 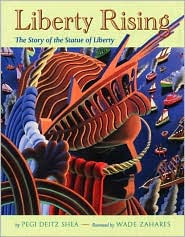 Last month, along with 500 plus children I did a mural on the floor, inside and out, at the Whitney Museum of American Art in New York based on my book Liberty Rising, The Making of the Statue of Liberty, where they gave all the participants my book. Elaine: Window Music, your first picture book, was designated a New York Times Book Review Best Illustrated Children’s Book. 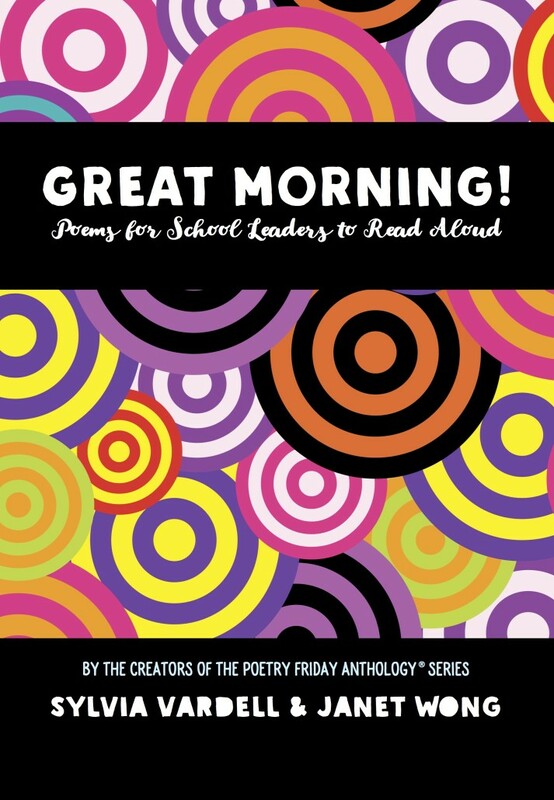 Do you feel that award opened more doors for you in the world of children’s book publishing? Wade: It was definitely a great jump start! I was working with Viking at the time and it got them very excited to be working with me and in having me do another book. As an artist it boosted my ego quite a bit, which was definitely needed at that time as I had just moved from Boston to Maine. Ten years later I am still using the fact as publicity. 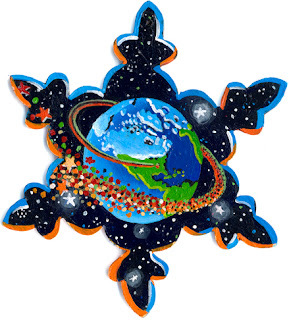 Elaine: In addition to illustrating children’s books, you also create works of fine art. Is there a difference in how you approach the two? Wade: It is almost exactly the same. You can’t tell the difference between my book illustrations and my gallery work. When I do art that is not in a book I generally work on one piece at a time—but when I do a book, I work on all the art at one time, bringing all the pieces to completion at the same time. Elaine: Have you ever considered writing a children’s book? Wade: I sure have. I have folders of ideas but can’t seem to put an entire story down on paper. I am trying to write it as if I were writing a song, which I haven’t done either. I have also worked with a few writers on a couple of ideas but so far that hasn't worked. I always say when the story is ready to come out of me it will just pour out. Elaine: Do you have any new books coming out next year or any projects that you are working on at the present time that you would like to tell us about? Wade: I just finished my roughs for my newest book Pony Island with Walker books which is due out in the spring of 2009. It a story by Candice Ransom about the ponies on Assateague Island, a small island off the coast of Virginia. Next week I will start the final pieces of art and have a deadline of March 2008. I work on all the approximately 20 pieces of art at the same time so they’re all at the same level of completion. I do have all the paper cut. 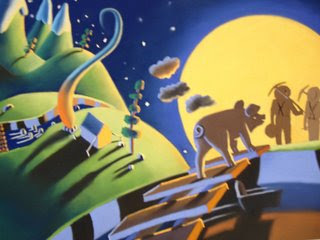 I am also working with a design company, White Dog Arts, designing a new web site for my self, zahares.com. I am drawing the entire site so it is taking a good chunk of my time. The site will be up and running very soon and when it is I will be sending an announcement out. As I also mentioned, I am doing a 12’ x 36 ‘mural at the new student center at Philips Academy in Andover, Massachusetts. I have been doing freelance work for the academy since 1994, including campus maps, bulletin covers and scratch board ink renderings of their many buildings. Elaine: Liberty Rising was the inspiration for your 2004 snowflake. What was the inspiration for your 2005 snowflake? 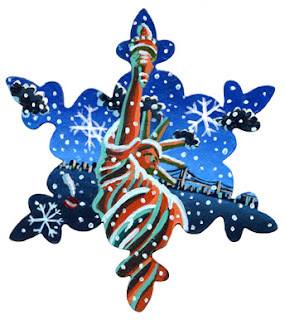 Wade: The release of Liberty Rising happened during the time I was creating my snowflake for 2005. I had already used that book for my 2004 snowflake and was also stuck on the story of people coming from all over from the world to settle in America so the idea of “The World” popped into my head. 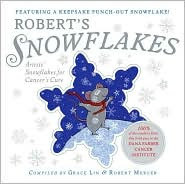 Elaine: Can you tell us about the snowflake you created for Robert’s Snow 2007? Wade: To me, painting the snowflake is almost as difficult as painting an entire book. I took my idea for the snowflake from my newest book Lucky Jake, having Pa, Jake and Dog walking over the mountain on a cold winter night. Being from Maine, those cold winter nights with a full moon are some of my favorite nights of the year. Wade's 2007 snowflake is the "mystery" snowflake. As far as I know, no one has caught a glimpse of it yet. Snowflake investigators are hard at work searching for an image of it. I promise to post a picture of it as soon as the snowflake is captured on film. All illustrations © Wade Zahares. They may not be used without his permission. REMINDER: WIN A PRIZE!!! I do hope you’ll stop by to read all of my Blogging for a Cure interviews and to comment about the artists and their work. I have a special prize for some lucky person who leaves a comment at any of my six posts featuring a Robert’s Snow artist: a limited edition giclee print of an illustration from Grace Lin’s book Robert’s Snow! Each time you comment at one of my Blogging for a Cure posts about a Robert’s Snow artist, I’ll put your name in a hat. If you comment at all six posts, your name will go into the hat six times! The drawing will take place on November 19th, the day bidding begins on the first of three Robert’s Snow 2007 auctions. I also have several consolation prizes for commenters who don’t win the “big” prize: five small prints of the Robert’s Snow mouse(mice). Here is a link to my interview with Scott Bakal. Here is a link to my interview with Alissa Imre Geis. Here is a link to my interview with Wendell Minor. Here is a link to my interview with Susan Kathleen Hartung. 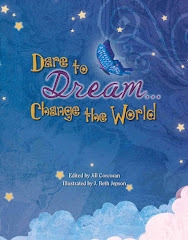 Here is a link to my interview with Mary Newell DePalma. Well, here's another illustrator I've never seen. 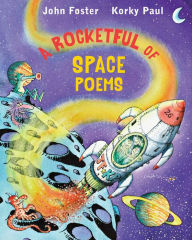 I love his bold work, and I'm definitely going to look for that poetry book! Thanks for all your wonderful features. I have learned so much. Liberty Rising looks amazing---I love stories about the creation of things. I was lucky enough to go up to the top of the Statue before they closed it. And how great is it that a school has hired an artist to do not just a mural, but maps and bulletin covers. I know it's a private school, but wouldn't it be great if every school had a children's illustrator to provide them with beautiful art like Zahares? Can't wait to see the snowflake when you track it down! Man, I know I say I love the light in lots of the snowflakes, but this guy -- wow. He draws shadows like no one I've ever seen. The detail plus the light and shadow play really makes a statement -- I think his this year's snowflake is going to be sublime. Thanks for sharing this, even sans snowflake!! I love a mystery ... will look forward to seeing that flake. Also to seeing the book on Chincoteague. I've been there many times and have seen lots of renderings of the ponies, but something tells me Wade's style will depict them in a whole new light! Wow. I really love the illustrations here. 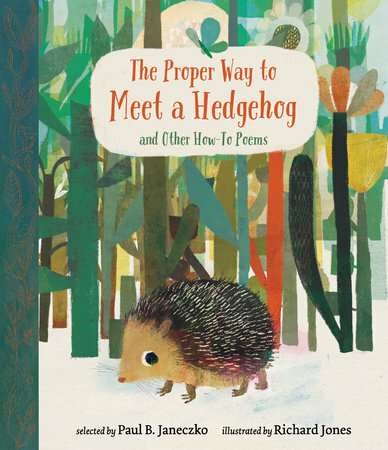 I loved (and reviewed at 7-Imp) Lucky Jake, but this is a nice reminder that I need to go get his other books. What eye-popping perspective. I love it! I'm going to make a very long list of books-to-search-for-at-the-library, as a result of this Blogging for a Cure effort, all the new illustrators I've met and books I remember I haven't seen from some of my favorites. I'm looking forward to seeing that snowflake, too. And now I wanna see if Wade will let us feature one of his illustrations at a kicks list. His work is fabulous. 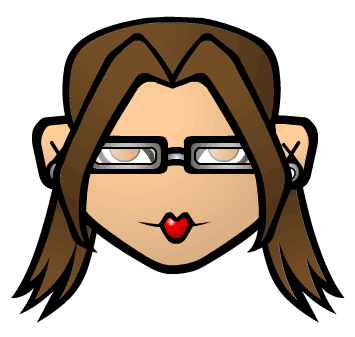 Thanks for all your well-written (and very heart-felt) features, Elaine! Oh, and I especially can't wait to see that snowflake, since it's from Lucky Jake, which is a beautiful book. I put his Big Bad and a Little Bit Scary book on our county's summer reading program a few years back. 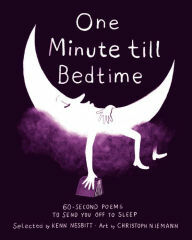 It killed at booktallks. Looking at his other books, I'm reminded of his talent. Can't wait to see what he did with the snowflake. Thanks for your wonderful features on these illustrators. Each one of your write-ups was through and interesting, and I give you props for all the work you did in putting those features together. I didn't think I'd seen his work before either, but then when I saw the cover of "Lucky Jake" I thought, that one looks familiar! Love the graphic element he has in his work. Can't wait to see his website. I sure hope he shows his process and the size of his work. Interesting how he has sized it down. I found this a necessary, and difficult, adjustment to do for picture books too. Sure am looking forward to seeing that mystery snowflake!! Wade art "pops" out at you like a pop up book! The colors are vibrant and "fun" to look at. Truly a talented "Maine-iac!!!"